William Hebditch - January 1st, 2012. William Hebditch - March 30th, 2019. What a lovely week of weather we’ve had. 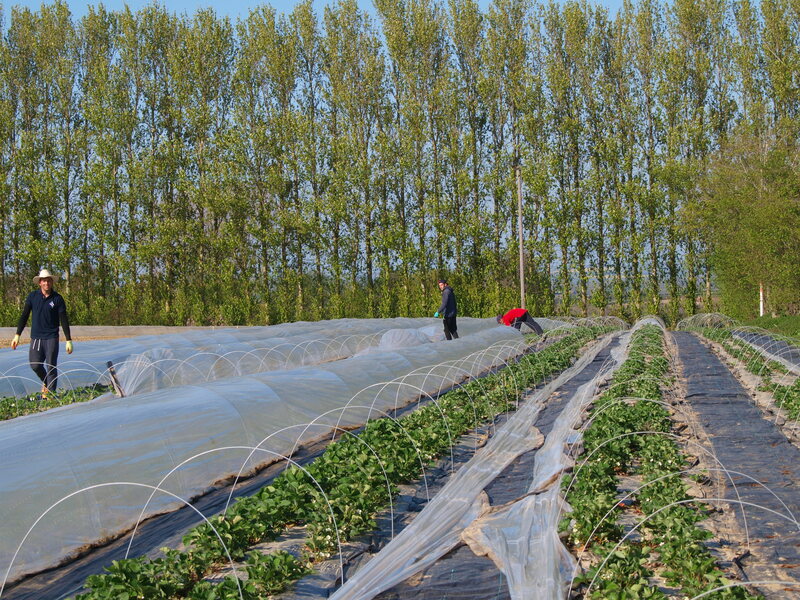 Allowed us to get all our plastic out into the fields, asparagus, rhubarb and seakale all covered and growing. I hope we’ll start to harvest week beginning the 15th of April. There is the most fantastic plum blossom this year. In the papers there have been several articles telling of the demise of solitary bees and hoverflies. Just to be contrary, we have had the most immense hatch of solitary bees which have been enjoying the plum blossom. I don’t know why we have had such a population explosion. Sometimes I wish I understood insect demographics, last year we had a crash in the numbers of light brown apple moths, this year the upsurge in little bees and hoverflies. Lots of overwintered Brimstone and Peacock butterflies as well. Meanwhile the nonsense of brexit continues. Just adore the voting habits of J R-M. He would make an interesting prime minister. I’m sure that would really improve our standing in the world. Oh for some decent politicians! William Hebditch - March 14th, 2019. Another week, another shambles. What must the rest of the world think of the UK? What a shambles our politicians are. Oh for a decent opposition. Who on earth does one vote for if and when the next election comes around. Of course, I hope the next election will be to elect our MEP’s. Undoubtedly wishful thinking unless the can gets kicked a bit farther. Meanwhile the wind blows and we haven’t been ale to deploy much polythene yet. Next week the weather is slated to improve so we should be able to crack on. Buds and flowers are moving quite quickly, so looks like the sprayer will be busy. It seems a strange thing to be spraying flowers in the early spring to protect fruits from rotting in the autumn but that’s what happens. Diseases like Botrytis and Sclerotinia hang around as latent infections till the fruit starts to ripen and then the disease expresses itself and starts to form mycelium and spores and we get rotten horrible fruits! Hence try to control the disease from entering the developing fruitlet through the flowers and the wounds that occur when petals fall. It’s a great way to minimise pesticide residues and actually be more effective than trying to protect the developed fruits. It will be interesting to see if the asparagus is any earlier than usual. There is a suggestion that a dry September advances asparagus growth. Don’t ask why, nobody knows yet. With some of ours covered we hope to be cutting by mid April. I will keep you informed as to progress. Perhaps something may change with the Brexit saga by then. William Hebditch - February 13th, 2019. We have ravens apparently, at least 2 pairs. I wonder if that’s a good or bad omen. My neighbouring twitcher is doing our great farmland bird count. I wonder if we have anything rare? I know I haven’t written anything for ages, but what has changed with the great Brexit saga. B all, it seems. The only good thing that’s come out of it are the posters put up by “led by donkeys”, check it out on twitter. Nice to be reminded of what our great and good leaders have said over the last few years. Led by donkeys seems to be absolutely right. Where on earth is there any god leadership in any of the Westminster parties? I struggle to understand how our country can be mended of this horrid split. The continuing animosity between the 2 sides is so upsetting. The brexiteers lack of historical knowledge of the Irish situation is extraordinary. The thought of returning to a war in our own backyard is more than scary. Farming wise, we’re here for the time being. We hope to be able to produce all our crops as usual this year, presuming our Romanians will come back to see us. Crops, bar raspberries look to have good potential. Flower bud is reasonable in quantity and the open autumn really helped. Winter chill is still lacing, but there’s a while to go before we can say winters over. William Hebditch - July 9th, 2018. What a mess our politicians are in. It is quite difficult to understand why Johnson and Davis agreed on Friday then resigned, why didn’t they do it in front of the whole cabinet? Small cojones perhaps. I still wish the Brexit side would really explain what the advantages are outside of the union. Most economists, many major companies and even New Cross Fruit Farm think that little good will come out of it all. I am fascinated that Lord Lawson is getting French residency and J. Rees Mogg is setting up part of his hedge fund in Dublin. That shows real confidence in the UK. Ah, but, we’re going to have new trade deals with that sane man in the USA. Perhaps we should ask Putin to buy us out. Interesting to find that Aaron Banks had 11 meetings with the Russian ambassador around the referendum time. I was always told to follow the money… so where is Banks making his stash, and Rees Mogg? What about Farage and his crew. I can’t see the benefit in turning the UK into a backwater, loosing skilled jobs and increasing the number of zero hours contracts. Ok, we may have lots of jobs when all the “Europeans” leave the health service, care homes, hospitality and even horticulture. It will certainly devastate the tax base and hence any remaining Government services. No doubt we’ll still be able to send our armed forces around the world, exerting our non existent influence. Big aircraft carriers with no planes.. sounds useful. 4 nuclear submarines under the ultimate control of President Trump…Nice one. It’s interesting to see how horticulturists, like us, are changing their investment plans. A lot of people planting perennial crops are holding off making investment decisions.. just like the car and aerospace industries. Perhaps some good will come of it. Perhaps we can be serfs on Rees Mogg’s estate.